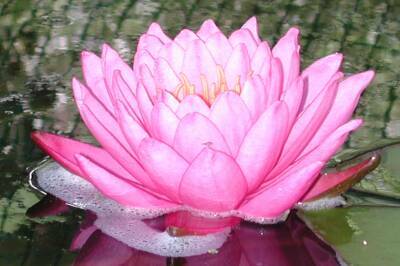 In the fall of 2000, I picked up a half-price pink lily at Russells Garden Center and stuck it in the pond. It actually overwintered in a rubbermaid container in the basement. 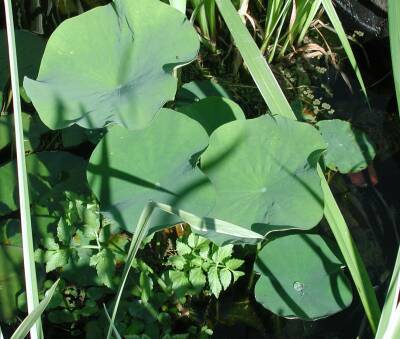 By the end of the winter, the water was pretty disgusting -- but all the plants in it were trying to escape. 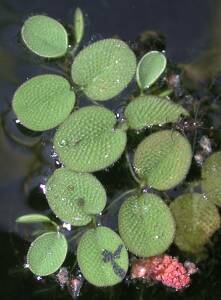 This is Nymphaea Gladstonia (which we bought purely because of the name) that lives in the bottom pond. It is pretty vigorous and is now putting up two or three flowers each day. 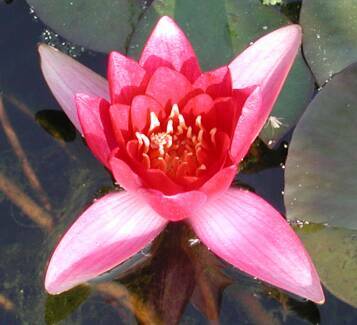 I moved the pink lily into the bottom pond -- I am running out of space. So far (June 2001) it has put up one mondo flower. The curious effect in the background is a reflection of the net that covers the pond (to keep out the herons). This flower is much more impressive than the other two lillies -- maybe my cost cutting has caught up with me! This is the generic red lily that came from Home Depot. It works, but the flowers are nothing like the glories of the pink one. I may have to do some upgrading -- though I would be rather disheartened to throw out a perfectly good plant. Because I am cheap, I buy plants at the end-of-season sales. This came from Russells Garden Center, and was originally quite expensive. It worked quite well, but I really don't have enough room to let it grow as much as it wants. 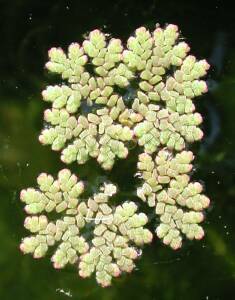 It lives in the top pond, and as such, gets infested with aphids. This year (2002), I'm not feeding the top pond fish in an effort to encourage them to eat the bugs. After two months, it seems to be working, though I feel a little guilty about their slow rate of growth. 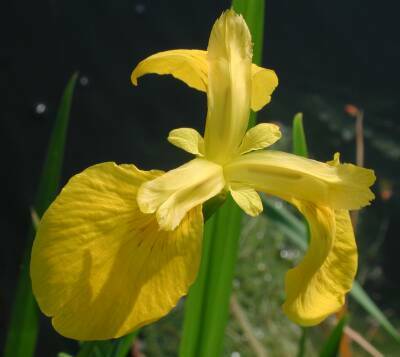 The yellow flag iris bloomed for the first time this year. I bought it in the spring of 2000, but it never flowered. I split it into three plants, and each of them is doing really well. In fact, I have already split one of the these again and given one plant to a fellow ponder across the street who is just starting up. I guess that they are pretty hardy and difficult to kill! The cattail is doing explosively well. 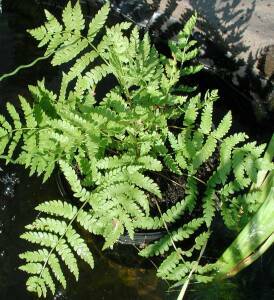 It has grown from one rather measly-looking plant in 2000 to three pots full in 2001. Also it is blooming. The problem is that it keeps blowing over in the wind. I tried putting rocks in the bottom of the pots, but it is so tall (maybe five feet) that the wind just knocks it straight over. Have you any suggestions? 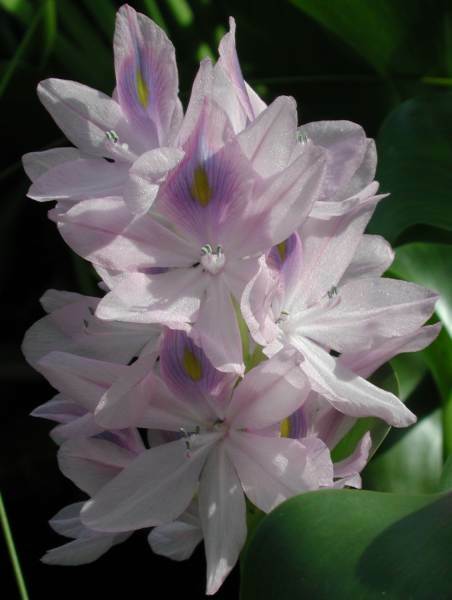 The water hyacinths are growing like anything this year. They are even blooming -- something that I have not achieved before. Maybe I throw them out too quickly. 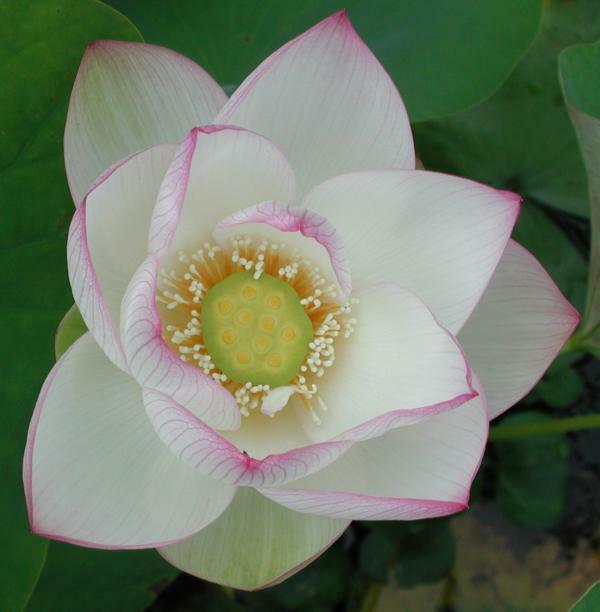 The lotus has put up a bunch of aerial leaves, but no flowers as of yet. Last year it never flowered, but it did stick a root out of it's pot and into another pot. That new pot has got five surface leaves growing out of it. I'm hopeful that it may turn into a real, working, lotus this year. Time will tell. I got one flower in 2002. It put up three buds, but only one turned into a real flower. Unfortunately we went on vacation on the day that it came out. 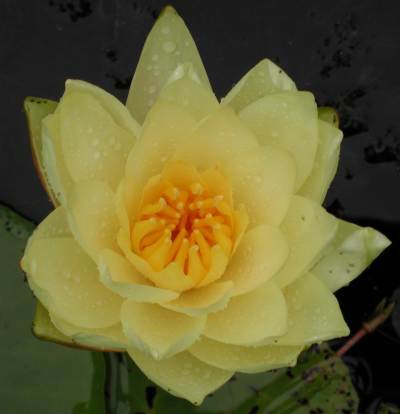 A heavy rainstorm then knocked the petals off (according to a neighbor who was taking care of the fish). The dwarf bamboo didn't do much last year -- maybe it will do more this year -- although I'm not sure what it is supposed to do! The foliage is nice and green, but I am hoping for more. I visited the New England Wildflower Society's annual plant sale at the Garden in the Woods this year. 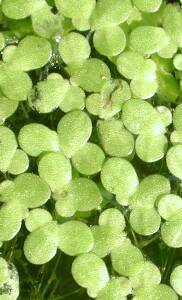 I picked up several bog plants that I have since planted in pots, but kept the soil surface out of the water. 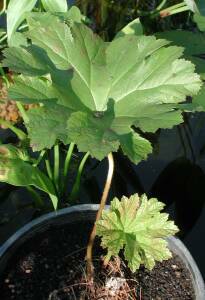 Umbrella Plant (Darmera Peltata) This is supposed to have huge leaves and flowers in the spring. Well, it certainly won't flower this year. If it turns out half as impressive as some of the pictures around, then I will be amazed. It currently has two leaves. Cinnamon Fern I have always been impressed by these growing at the side of the big pond in Garden in the Woods. Swamp Milkweed I hope that this will attract a Monarch to lay its eggs, and we will get to see its lifecycle in action. Venus Flytrap This (although a bog plant) is actually going to stay in its cup. My three year old picked it out (from the kid's table) and she thinks it is cool. Happily it came with instructions -- which included 'You cannot water this too much' and 'It likes sun -- the more the better'. It has just spent it's first day outside in 90F weather. it had three open traps this morning, and now it only has two. The other trap brings to mind an overstuffed purse -- it clearly has some type of insect in there. I'll add more photographs when the plants begin to do something exciting (the first two only have pictures so far). 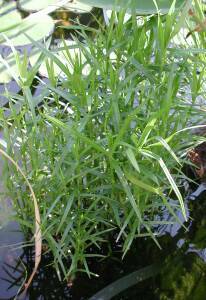 Other plants include: arrowhead plant, some zebra rush, thalia dealbata, butomus umbellatus, horse tail?, chameleon plant, and some water celery. There is an assortment of some floating stuff -- Azola (in the middle) and some other stuff that I haven't identified. Some of these plants came from Hardwicke Gardens in Westboro on Route 9. 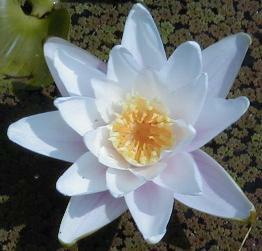 They seem friendly and knowledgeable, and they specialize in water plants.